Step (1) − Extract the downloaded WordPress folder and upload it into your web server or localhost. 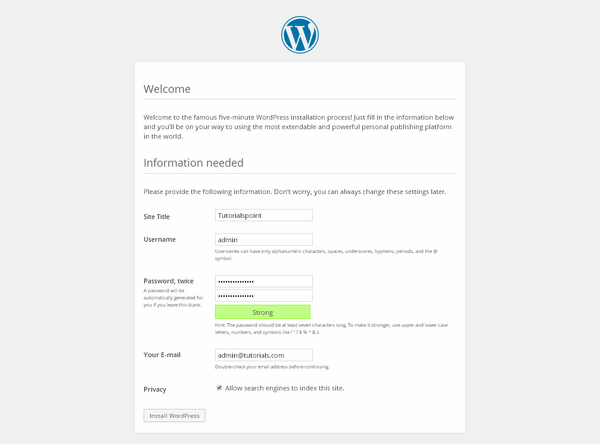 Step (2) − Open your browser and navigate to your WordPress file path, then you will get the first screen of the WordPress installer as shown in the following screen. In our case, the path is localhost/< Your_wordpress_folder >. Select your language for the WordPress and click on Continue. 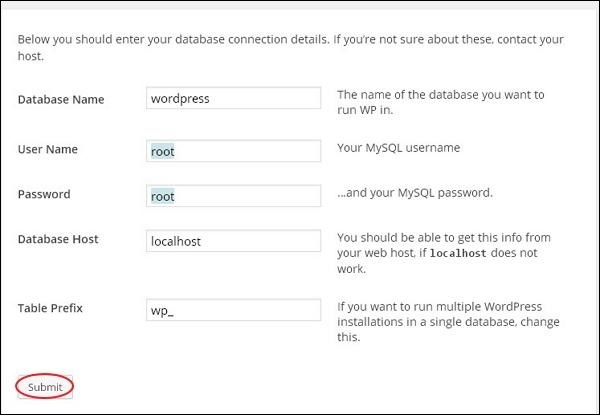 Step (3) − In this step, you can view the information needed for the database before proceeding with WordPress installation. Step (4) − Here, you have to enter the information about the MySQL database as described in the following screen. Table Prefix − It is used to add prefix in the database tables which helps to run multiple sites on the same database. It takes the default value wp_. 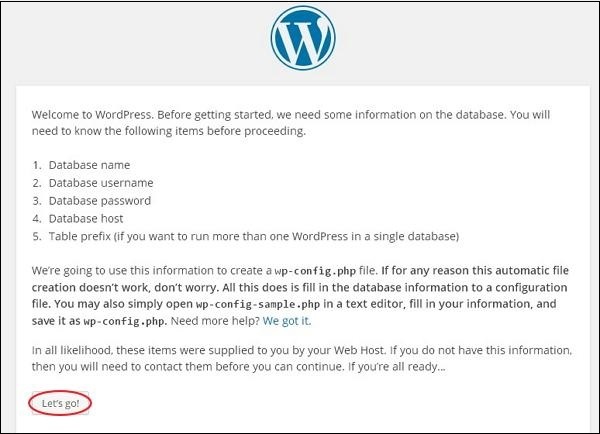 Step (5) − WordPress checks the database setting and gives you the confirmation screen as shown in the following snapshot. Step (6) − Enter administrative information. Step (7) − After installation being successful, you will get a screen of the stating success as seen in the following screen. 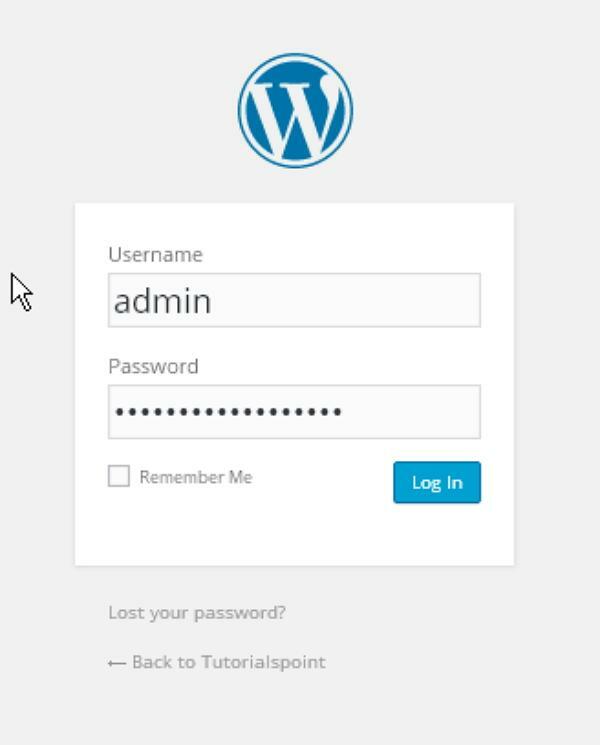 You can view your username and password detail added in WordPress. Click on Log In button. 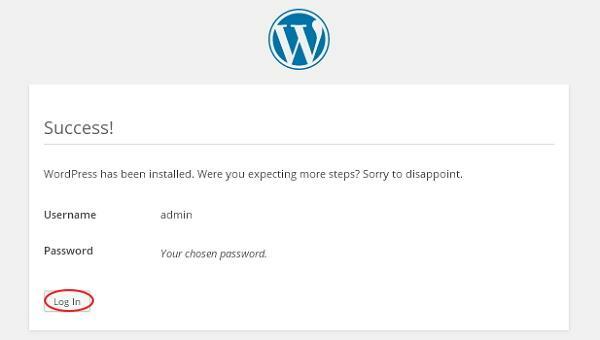 Step (8) − After clicking on login, you will get a WordPress Admin Panel as depicted in the following screen. Enter the username and password which you had mentioned during installation as shown in step 6 and click on the Log In button.